Every day I can share my passion for music is a good day! Woodwind instructor Tedd Griepentrog has been sharing his passion with others for more than 40 years. As performer, educator, clinician, arts administrator, and presenter, he has shared his musical expertise with students, educators, and audiences throughout the United States and abroad. As a performer, Tedd has done concert tours in all 50 states and 14 countries, premiered 12 new concertos for saxophone, and been featured in numerous television broadcasts and recordings. During his career as saxophone soloist with the U.S. Army Field Band of Washington, DC, he played for every president from Ronald Reagan to George W. Bush. 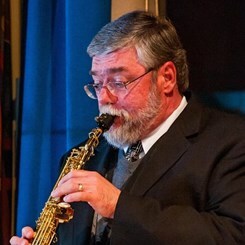 As saxophonist, clarinetist, and flutist, he has performed with the Boston Pops, Cincinnati Pops, Milwaukee Symphony, Detroit Symphony, and Baltimore Symphony Orchestra, and in theatre orchestras for Broadway and opera productions. He has performed with numerous big bands and accompanied jazz greats such as bassist Ray Brown, trombonist Urbie Green, trumpeters Marvin Stamm and Allen Vizzuti, and saxophonist James Moody. He was featured in a cover story in the internationally distributed Saxophone Journal. As music educator, Tedd served as Educational Activities Coordinator with the U.S. Army Field Band, where he developed the Field Band’s Legacy CD reference recordings and Instructional Video Series, and coordinated clinics and performances that annually reached more than 100,000 students. He was recruited as a Yanagisawa/Leblanc clinician by corporate president Vito Pascucci and presented clinics and master classes at colleges and universities throughout the United States. During his 40 years of teaching saxophone, flute, and clarinet, he has worked with more than 1,000 students, many of whom have gone on to major music schools and are playing professionally and currently teaching the next generation of student musicians. In recognition of his long-term contributions, the National Association for Music Education (formerly MENC) presented him with the 2003 Outstanding Music Educator Award. Tedd has been a presenter at conferences of the National Association for Music Education, the Network of Visual and Performing Arts Schools, the National Association of Partners in Education, the Maryland Governor’s Conference on Disabilities and Music, the National Association of Secondary School Principals, Created to Praise, and the League of American Orchestras. He holds a Bachelor of Fine Arts in Music Education from the University of Wisconsin-Milwaukee and a Master of Arts in Arts Administration from Goucher College. After retiring from the military, he served as Executive Director of the Columbia Orchestra for 13 years, and is currently band director at St. Paul’s Lutheran School in Glen Burnie, Maryland. He and his wife, pianist Maureen Griepentrog, have been teaching at Music & Arts since 2013. Request Lessons with Tedd Griepentrog today!